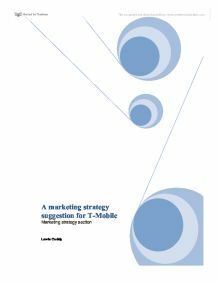 A marketing strategy suggestion for T-Mobile Marketing strategy section Lewis Cuddy My marketing strategy suggestion To account for the modern necessity of e-commerce I would improve the T-Mobile website. The T-Mobile website is already very effective and offers almost everything available in a shop therefore there are only two ways in which I feel improvements can be made; Offering a phone comparison feature would be very useful. This feature would allow customers to compare the functions, specifications and prices of several products at once. When loading one of the 'shop' pages such as pay as you go deals I found the initial page very overpowering. 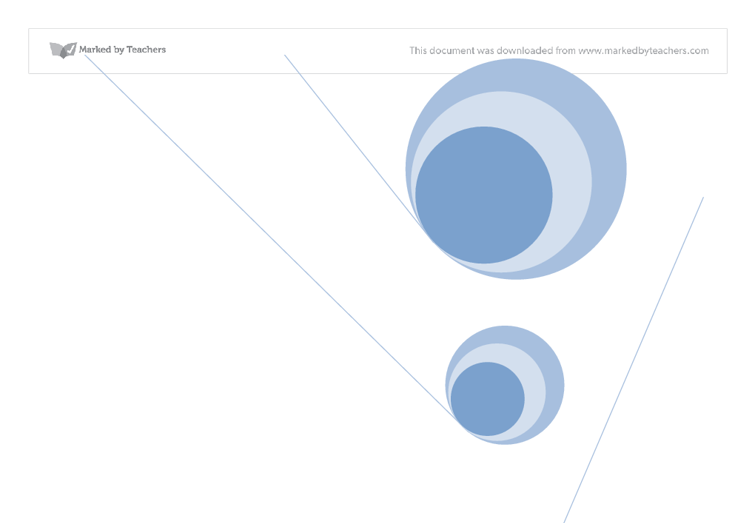 There is a lot of information and graphics on a single page and therefore I would recommend simplifying these pages. I would recommend two new sponsorship deals, one with Manchester United FC and the second with X-Factor. Manchester United FC is not only regarded as the best British football club but they also have the largest fanbase in the world. ...read more. What this means is that 13 million viewers (as of 2009) will spend 3 minutes watching a clip purposely created to advertise T-Mobile. My new slogan for T-Mobile would be: We Are The Best. I feel that this slogan is very simple and clear and if supported by T-Mobile being the 'best' mobile phone service then it could be very effective. It shows that T-Mobile is confident and clearly is offering the best deals otherwise they would be putting their reputation at jeopardy by using such an outgoing slogan. My product recommendation I recommend T-Mobile launch a campaign promoting my four packages that are specifically aimed at four market sections, girls, boys, business users and under 10's. All four packages will be based on colours; I have chosen the colour idea as I feel it is very general and therefore can be targeted at everyone rather than using idea such as a Simpson's theme where it will only appeal to a select market. ...read more. The iPhone offers a wide range of functionality for business users including stocks, e-mail etc. This package also comes with an exclusive application that allows online banking on the iPhone. This package was deliberately assigned the gold package as gold symbols wealth and prosperity which shall appeal to business users. The Blue Package The blue package offer 10 minutes and 50 texts as well as unlimited calls to a parent's number. The package comes with an exclusively made KDDI phone, which uses advanced technology and parental controls to ensure a child's safety. The phone offers many safety features including unlimited calls to a parent and a detailed record of all calls and texts to sent a chosen email. The Green Package The green package offers 400 minutes and unlimited texts for �20 a month and comes with a free blackberry storm. All customers are entered to a monthly competition that is run in link with T-Mobiles sponsored football team. The winner receives a VIP match day experience. This competition combined with a highly desired phone will appeal to men. ?? ?? ?? ?? ...read more. This student written piece of work is one of many that can be found in our GCSE Marketing and Markets section. if the company sells unrelated products so they may choose to work by product. This is because companies using this structure focus on having a different manager for each product they produce. This helps the company because it makes one person responsible for the successes and failures of the product which ultimately can only improve motivation. Heelcounter-the area of the shoe that holds the back of the heel, just underneath the Achilles tendon. This area should be snug but not tight, comfortably cupping the back of the heel. Fashion Marketing Concept. The function of Fashion Marketing. * Using fewer hardwoods for fitting in store design. * The use of more energy efficient transport. EMAS, the European Eco-Management and audit scheme certified Hoescht, a European polyester and fibre manufacturer for the use of environmental practices. The result of this led to a report on the use of water, energy, production emissions and recycling. Analysis of the current strategic situation facing Marks &amp;amp; Spencer. To encourage suppliers to use the most modern and efficient production techniques 3. To work with suppliers to ensure the highest standards of quality control 4. To provide friendly, helpful service and greater shopping comfort and convenience to our customers 5. The saints don't advertise on TV or cinema as it is too expensive. Packaging Packaging of the merchandise in the Saint's club shop is important and the merchandise accounts for 17% of the clubs total revenue. Merchandising How the club merchandise is laid out in the shop is really important. Discuss the impact of consumer behavior on marketing decisions. The customer's expectation for a Vin de Table category is better tasting wine for a low price. That is what the market wants and ignoring a large percentage of the market is not going to help the growers get out of their crisis. Promotion Cadbury Dairy Milk uses a lot of promotion to advertise their products. In supermarkets Cadbury Dairy Milk chocolate bars are placed in Gondola ends. These are useful because before customers go and pay for their products they will see what is being sold on the gondola end as it will stand out.